Star Wars, definitely the centerpiece of my collection. I picked this one up at a garage sale. The woman I bought it from definitely knew what it was worth, which was way more than I was willing to pay. Just for old time's sake, I asked if I could play it. She turned it on, nothing. The monitor was completely black. Needless to say, I was able to get it at a (very) reduced price once I explained how difficult it was to repair color vectors. The real problem turned out to be a loose connection on the PCB. 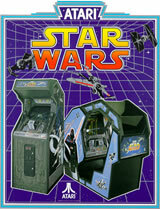 My strongest memories of playing Star Wars was at the Rose Moyer Cinema in Portland. I believe it was the cockpit version of the game, but it might have been a standup. I just remember hearing Vader's voice, and trying to take him out during the tie fighter attack wave. Rose Moyer was a great environment for playing games; it was dark, loud, and crowded. Star Wars is the one game I have been constantly looking for since I started collecting. Suffice to say, it will never leave my collection.